It’s amazing how much you can get and do for FREE today. With a modest laptop or desktop computer and access to the internet, you have a huge selection of free operating systems and high quality software to do just about anything you want to do. Depending on the application, I install most of this software on any new machine I set up. I like them all, my favorites are marked with a “♥“. For me “cross platform” usually means Ubuntu Linux and Windows 7 or 10, but much of the software listed here is available on Mac and other versions of Unix/Linux too. TightVNC ♥ Great VNC remote desktop server, client, and java client for portability, features file sharing and scale-able remote desktop windows. VirtualBox ♥ Virtual machines are awesome! Want to try a new OS in your existing OS? Want to try some software before installing it for good? KDiff3 ♥ Best diff and merge tool, works on files or directories, and only tool to feature 4 way merging with re-sync. OpenSCAD ♥♥♥ “The programmer’s 3D modeler”, my go-to tool for creating most models for 3D printing. Octoprint ♥ control your 3D printer over your network with powerful cool plugins, record time lapse videos, and even run from a Raspberry Pi. There is a HUGE variety of Linux flavors to choose from, https://distrowatch.com/ is a great website to see what’s popular and read about the pro’s and con’s of each of them. (Check out this GNU/Linux Distributions Timeline from Wikipedia) One of the great things about Linux is that most distributions (“distros“) have live CD’s available; download a disk image, copy image to USB drive or burn a CD or DVD, reboot your computer from the USB drive or disk and you can try the OS before committing to a full installation. You can also run them from (and later install them to) a virtual machine like VirtualBox to try them, keep them around, and copy them between physical machines, even if they are running different operating systems. I hope you found something useful here! If you have any suggestions I’d love to hear about them, please comment or contact me at Workshop 88 (info@workshop88.com). On a whim I decided to whip together a collet mounted Z depth probe for my CNC machine. It took 25 minutes and works GREAT! Measure length that I think will fit into the collet with clearance for the switch and wiring, marked with a pencil. Clamp into a vise and cut with hacksaw. Be sure to wear eye protection. I used hardboard to protect the soft aluminum from being gauged and pressed out of shape in the vise. Use a hacksaw to cut a square notch into one end. I cut just off center down the middle by eye about half an inch then cut sideways from the thinner side to remove D shaped slug leaving a D shaped semicircular shaft. The rod was slightly oversized and would not fit properly into my collet. I clamped it into the chuck of my drill press and used a file on the spinning rod to reduce its diameter until it fit. Files are designed to be pushed away from the operator so be sure to pay attention to the direction of rotation and file, this results in pushing the file away from you pressed against the right side of the cylinder in a standard drill press. Of course, only test the fit when the drill press is off and stopped. You could also use sandpaper if a file is not available, but it will take longer. I used the file to take sharp corners off business end. Align the switch with the cutaway in the end of the rod and mark the height of the mounting holes in your switch on the round part of the D.
Notice the pencil marking near and on my finger. Use the hacksaw or file to cut a notch in the back round D part at the height you marked. This will be needed to hold the switch securely in place later. I selected a long length of stranded wire with an RCA connector on one end from the junk wire drawer. Just about any flexible wire will suffice, just remember that the wire will repeatedly flex with the motion of the machine so should not be too stiff and ideally should be stranded, not solid conductor type. To attach the switch to the D shaped end of the aluminum rod. I lashed the switch to it using a twist tie, for a more permanent connection add a drop of epoxy between the switch and metal. Strip the insulation off a twist tie. It is easiest to remove 1/2″ – 3/4″ sections until you have a fully stripped steel wire rather than try to strip very long sections in a single go. Thread the twist tie through the mounting hole in the switch twice. 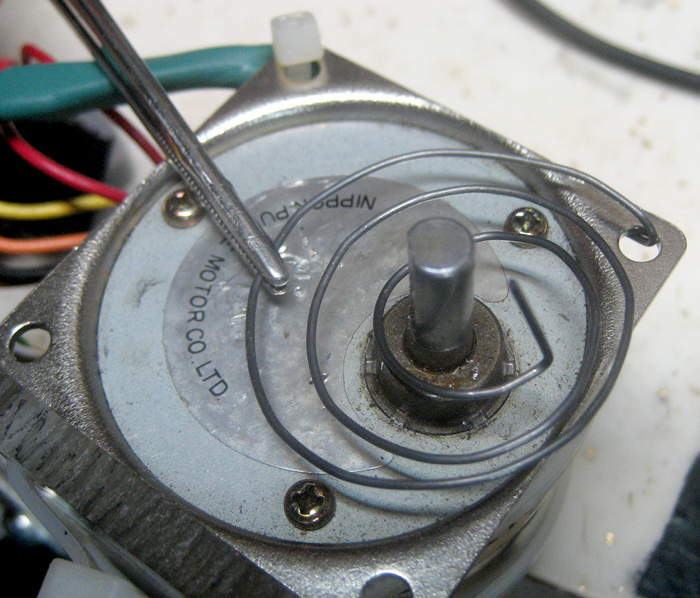 Slide the D shaped portion of the aluminum rod into the wire loop and start twisting the wire ends by hand. Be sure the wire seats in the slot you sawed or filed in the back of the round part of the “D”. Tighten the wire using pliers being careful not to break the wire or delicate plastic part of the switch. You may need to wiggle the switch in order to seat it properly on the rod aligning the hole with the groove for a tight fit. At this point I also bent the end of the metal switch plate slightly a few mm from the end to provide more springy direct contact right under the tip of the center of the probe to ensure the metal arm is what makes contact and closes the switch rather than pressing the microswitch under the arm directly down on the workpiece. Tie the electrical wire to the shank for a strain relief and attach the wire to your machine so that it does not get pinched or caught in moving parts. Completed probe elevated and engaged. Wire your probe. I threaded mine conveniently through the spiral compressed air hose. Connect your new probe to your controller’s digitizer input. Note: Wiring and configuring your motion controller is not included in the 25 minutes. I had already wired and configured a digitizer for Mach 3 using a Xylotex motion controller on the parallel port. You will need to configure your CNC controller to accept a probe and wire it accordingly. On my parallel port connection on the Xylotex motion controller I wired a 10k resistor from the probe pin to +5 and wired the switch between the probe pin and ground so when the switch is normally closed, the pin reads “0”, and when the switch is depressed the circuit to ground opens and the pin is pulled up to +5 and reads a logic “1”. I offer this as an example for my configuration but you should check your controller and software manuals to determine correct wiring for your equipment. In Mach 3 I can test my digitizer probe by looking at the diagnostics screen. When I press the button I can see the digitizer input light up telling me that the switch is working and the software is configured correctly. To test the digitizer function I issue a G31 Z-1 F10 command. This tells Mach 3 to move Z to -1 at a feedrate of 10 inches per minute (ipm) and to stop when the digitizer is engaged. To test reliability and repeatability I issued this command 12 times and recorded the Z height where the probe engaged each time. I entered these measurements into a spreadsheet to calculate the minimum, maximum, average and standard deviation of the samples… this probe was reproducible with a standard deviation of 0.000824″, under a thousandth of an inch. This is great for woodworking or PCB engraving. To really test it I mounted a piece of melamine on a set of 1/4 inch shims to create a severe slope and performed a standard engraving cut. As you can see, any slope or irregularity is a nightmare for engraving with a “V” bit. High portions of the work surface are engraved too deeply and lower portions may not be engraved at all resulting in an uneven line width. I used ScorchWorks G-Code Ripper to generate a new gcode file from the first one that included probing and compensated for the measured work surface elevation in the g-code. When I engraved the new g-code (on the right) it started by probing the surface, then asks the user to switch to a cutter bit and completes the engraving operation. This sample was engraved to a uniform depth which is an improvement but I still didn’t know how to set an accurate zero depth so it is too deep. The final missing piece was to figure out a way to register the probe zero height to the cutter z height. When you resume the gcode it will pause again for the tool change. Manually jog z to the work surface and manually zero Z.
I use a 0.001″ thick JOB rolling paper as my machinist mentor taught me. Place the paper under the bit and move it down one thousandth at a time until it just pinches the paper then either type .001 into the Z DRO or just zero Z if a thousandth of an inch is not critical. These steps are meant for you to understand the operations I had to go through with my machine to get great results. You may have to adjust these steps for your software/controller. The source artwork is really not intended for engraving, it’s just something I grabbed to run some tests, please don’t judge the it too harshly. You can see that the depth of cut is uniform across the finished piece. This would engrave just as well on a curved or irregular workpiece as well. This is particularly impressive considering how deliberately un-level the workpiece was fixtured. This isn’t just helpful for engraving, I recently used probing to correct for the irregularities in 4′ x 8′ sheets of 1/4″ plywood. These sheets can be warpy and wavy by over 1/2″ on a large part. Normally I would have to cut many passes with the 1/4″ bit potentially deep into my spoilboard to ensure good cuts. My machine is slow and those extra passes cost a painful amount of time. With probing I was able to cut each part out of the irregular 1/4″ thick material using a .3″ cutting depth and a 1/4″ endmill in a single pass with excellent results, several times faster than it would have taken me in the past. Here is a custom organizational shelving unit I made for a friend, it turned out great. It took less than 25 minutes to make the probe while taking all these pictures along the way! It took under 20 minutes the second time (see below), and it took waaaay longer to write this blog post. I hope this was helpful, or at least entertaining. P.S. Test your probe and wire it carefully! 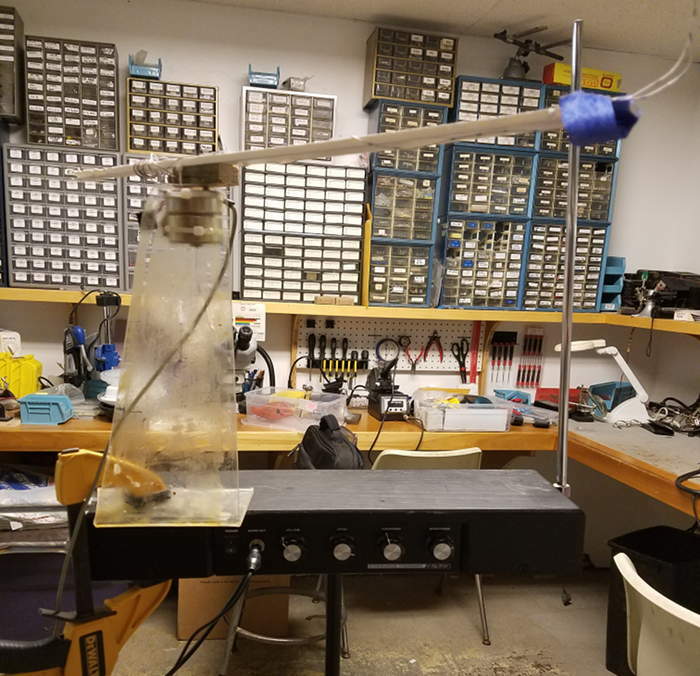 At the beginning of the first large scale plywood cut my CNC machine made several successful probes of the surface then plowed into the table with slow deliberate force destroying the probe switch. Upon close inspection, the alligator clips I hastily used to mount the probe for initial tests were still in use and shorted together bypassing the fail safe and switch operation resulting in the crash. It’s a good thing that it did not create a dangerous situation. I was able to re-cut the end of the rod and install a new switch in under 20 minutes which after careful rewiring has operated reliably ever since. 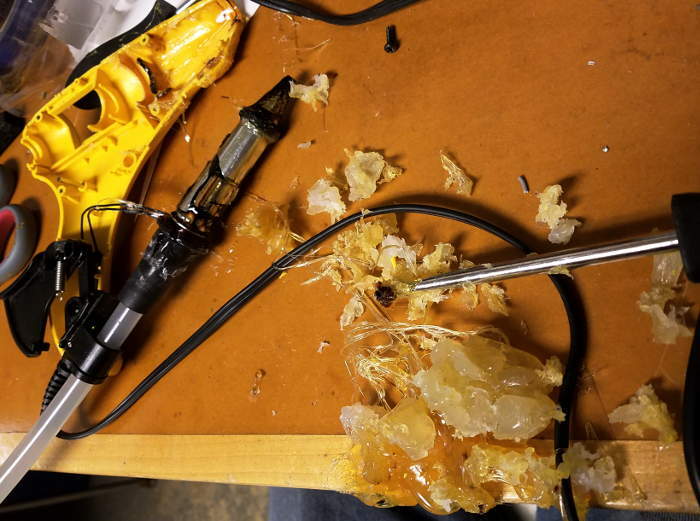 Knowing how critical hot melt glue is in a hackerspace, I’m sure you’ll be relieved that the mystery of why the trigger on the yellow glue gun stopped working has been unravelled, and that it even works again! There was no hope of getting the gun open until I let it get good and hot to liquify the glue. I was amazed to find the entire front half of the gun full of liquid glue. The great glob of solidified glue in front of the trigger answered the mystery question. As I scooped and pried the glue out, a clue appeared: I suspect this split in the silicone sleeve that guides the glue sticks to the melt chamber was part of the story. 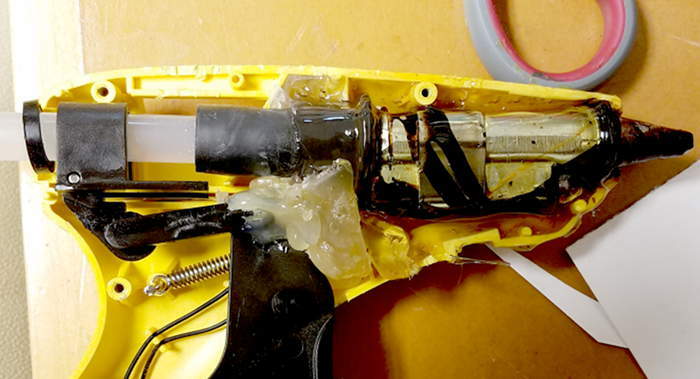 I wonder whether another part was some imagined incident when someone tried to use the gun with the tip badly clogged. With the gun thoroughly heated, he squeezed the trigger again and again, only to have no glue come out. “Where the heck is all the glue going?” he might have wondered. The gun works again, but no guess as to for how long. The fantastic isopropyl-alcohol-as-hot-melt-release-agent trick cleaned the bench so well that there’s no trace of the huge mess I made. Maker of CamBam supports Workshop 88 makerspace! CamBam site license & member discount! Workshop 88 would like to extend a big thank you to HexRay for supporting the our CNC efforts by allowing us unlimited use of CamBam on club Windows and Linux computers plus a discount on CamBam to Workshop 88 members. CamBam is an application to create CAM files (gcode) from CAD source files or its own internal geometry editor. CamBam has many users worldwide, from CNC hobbyists to professional machinists and engineers. Reading from and writing to 2D DXF files. True Type Font (TTF) text manipulation and outline (glyph) extraction. Be sure to check out their CamBam bundles with Mach 3 controller and CutViewer too. Personally, I purchased the full CamBam + Mach 3 + CutViewer bundle; I couldn’t beat the price and I’ve been happy with them to this day. This level of support from HexRay is fantastic and something Workshop 88 greatly appreciates! Stay tuned to see CamBam powered Workshop 88 CNC projects! THANK YOU Andy @ HexRay! http://blog.workshop88.com/interact-with-us/ or stop by our weekly open house any Thursday evening after 6:30pm. I love 3D printing. I’ve designed and printed hundreds of models on the Replicator 2 and have developed many useful skills and techniques. The Replicator 2 has a non heated polycarbonate build plate with MakerBot emblems laser cut into one side and the other side is frosted. I don’t care for having the MakerBot logo in relief on the bottom of my prints so I print on the frosted side of the platform. These are rafts but I don’t like having the MakerBot logo embossed on my work. This worked well for hundreds of prints but eventually, scraping the prints off the platform smoothed the rough surface and parts started sticking harder and harder to the build plate. Ultimately they stuck so hard that the force required to get a spatula or razor under a part started cutting grooves into the build plate. If the first layer does not bond well enough it can result in corners lifting especially for broad parts on unheated platforms. In the worst cases the part breaks completely free from the platform partway through a print leading to a stringy mess, wasted time and filament, and in rare cases the PLA can stick to and damage the insulation on the print head. Catastrophe! Lifted corner, parts broke free, filament everywhere, and damaged thermal insulation on the print head. If the first layer bonds too well to the build platform the part or platform may be damaged when removing the part. When using blue tape, it may not be possible to completely remove the tape from the part. I started using blue painters tape and Aqua Net hairspray on the build plate. I found this combination to work well with PLA, though I’m not sure how necessary the hairspray is. The problems are that the tape is damaged when removing most prints so needs to be reapplied frequently and can be difficult or impossible to remove from the bottom of finished parts. Blue tape stuck to part. Sometimes it’s impossible to remove all the tape residue. Blue tape doesn’t last long and requires sticky messy maintenance. I considered a heated build plate, and glass or metal build plates when the idea occurred to me to try to use a flexible metal build plate. I conducted several experiments using a cable chain model that is challenging to print due to fine detail and thin parts that need to bond well in the first layer. First I tried aluminum flashing with hairspray. Rough cut aluminum. Use gloves, sheet metal is sharp. Cut aluminum to size on the paper cutter. Thin sheet aluminum was curled and needed to be flattened. Rolling the thin rolled sheet aluminum flat with pipe on foam. A towel could have also been used underneath the material. Cleaned the sheet aluminum with ammonia and alcohol. Two coats of Aqua Net hairspray applied. Used heat gun to rapidly dry the hairspray. The PLA bonded weakly to the platform and the parts detached easily in the second layer. The upper right and lower left clamps had to be moved because the print head knocked them off. The nozzle interfered with some of the clips and knocked them off. The PLA did not adhere to the build plate. Failure. Aluminum flashing with wet hairspray yielded the same results. Failure. Using the back side of the same build plate I used a generous layer of glue stick. The PLA adhered wonderfully and the print turned out great. When done I removed the aluminum plate and was able to remove the print by bending the plate – Success! But the aluminum does not lay flat and the part left dimples in soft thin aluminum plate before letting go. I need a stronger material. I scrounged around and found a stiffer steel plate salvaged from a magnetic children’s book many years ago. I did not try to cut the steel plate to fit the platform because I don’t have a shear and did not want to dull my paper cutter cutting steel. I can cut the steel on the metal shear at Workshop 88. The print turned out great! But the plastic clips that hold the build plate to the printer are raised causing the plate to be irregular and warped and not flat against the polycarbonate platform beneath it. If you remove a print by flexing the steel it pops right off but it is still possible to dimple the steel this way. The dimples can easily be gently pounded out with a broad hammer with the steel on a flexible surface like a neoprene mouse mat or a towel. Parts firmly attached to the steel are easily removed using a spatula and/or a razor so dimpling turned out to be a non-issue. To get the platform to lay flat on the platform I attached a sheet of flexible rubbery plastic “refrigerator magnet” material originally intended to be a furnace vent cover to the platform with double sided tape. Excellent first layer adhesion with fine detail. The build plate is flat and level, firmly attached to the platform in the center without using clips which makes it very easy to insert into and remove the plate from the printer. The finish on the bottom of every part is smooth and shiny, far better even than when printing with a raft. Even though others reported using a coating of glue stick up to a dozen times, I found reused glue stick not to adhere well. Adding layers of glue builds up, so every couple of prints I wipe the plate down with a wet paper towel before adding a new layer. I’ve added alignment markings to the build plate to help install the plate consistently, to help center parts, and to help apply glue only where it’s needed for each print. Markings help guide application of glue and placement of parts in MakerWare software. Printed right where expected, with a beautiful first layer and finish quality on the bottom without a raft. This pinhole lens is .2mm thick and each hole is printed separately with 2 shells then the rest is filled in, if any pop off the build plate it will stick to the hot end and gather the rest into a blob of plastic. This folding phone/tablet stand (http://www.thingiverse.com/thing:692523) is a favorite model in my house. It’s a hinged phone/tablet stand that prints fully assembled. If you look carefully you can see that there is some slight curling. The plastic is pulling upward at the corners and even though it has not detached from the build plate it is deflecting it slightly up off the magnet. The finish quality of the base is comparable to printing on glass. Not every print has been perfect though, this is another phone/tablet stand that started to curl. The print head caught one corner and moved the entire build plate on the magnet. You can see it continued to print offset before I stopped it. It is impressive that it moved the whole build plate without detaching from the platform. I was able to reprint this model successfully. 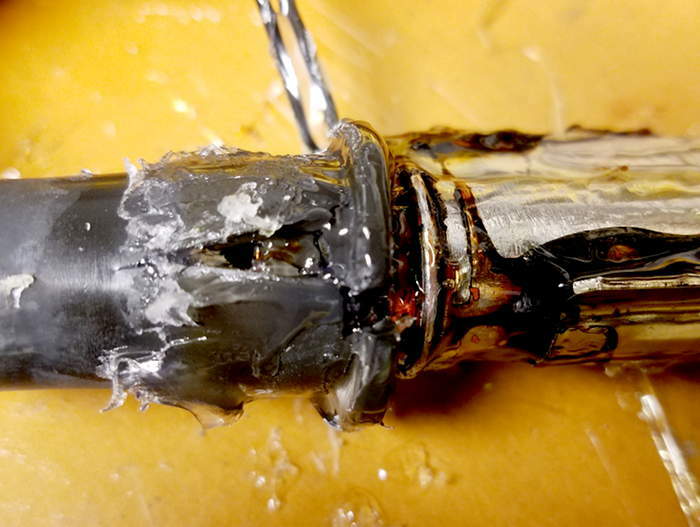 Only a heated bed or chamber can really prevent this issue entirely, but a stronger magnet may require more force to move. Cut the build plate(s) to size on the shear at Workshop 88. The build plate is still larger than the platform and must bend to go over at least one of the platform holding clips. Cover the entire platform with magnetic material. The current magnetic material does not cover the entire platform, it is what I had on hand. Find stronger magnets. The print quality is wonderful but it is still possible for corners of large parts to lift the platform off the magnetic base while staying attached to the platform. Thanks for reading, and good luck with your 3D prints! This tutorial will show you how to use Computer Aided Design and Computer Aided Manufacturing or CAD CAM tools to create and preview a Gcode file of the Workshop 88 logo that can be run in a 3 axis CNC Mill. Engrave (follow path): The tool tip will follow the 3D path provided. Profile: The tool edge will follow either the inside or outside contour of a path down to the specified depth. Pocket: The tool will remove all the material within a contour down to the specified depth. “Peck” used with drill bits, drills to successively deeper depths liftig the bit out of the work regularly to clear chips from the flutes. “Spiral” used with endmills that are a smaller diameter than the finished hole. “Waterline” similar to inverted pocket operations where bulk material is efficiently removed outside the 3D model to a number of stepped depths resembling waterline in a topological map. Typically used in a first pass with a large roughing bit to remove the bulk of the material. “Raster” moves the tip of the bit smoothly over the model in a raster pattern. Gcode is a “numerically controlled programming language” which is why a Gcode file extension is typically .nc. It is a human and machine readable text file. You will rarely if ever need to look at or edit the Gcode. This tutorial will demonstrate Engrave, Profile, and Pocket operations, which are the most popular.